To Arlington Rifle and Pistol Club members and guests. Our frames have been redesigned to allow the cross boards to slide in. We have some extra bases and will be spreading the steel out to accommodate more lanes of fire. Andy will be manning the grills. We will have lots of food. He comes highly recommended as a top chef, so the food should be delicious! Thank you all for helping out. 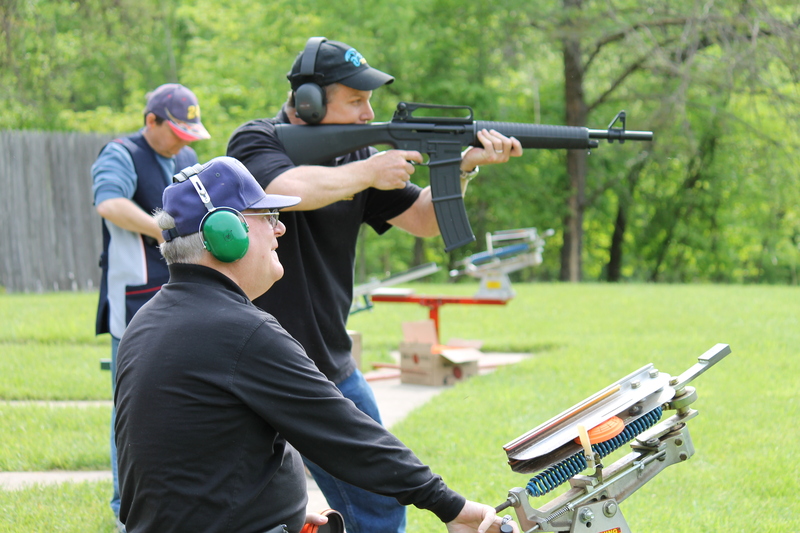 It should be a great day to try out some of your preban firearms. P.S. To all shooters. Please don’t aim at the bolts holding the steel targets. They are expensive and a pain to replace. 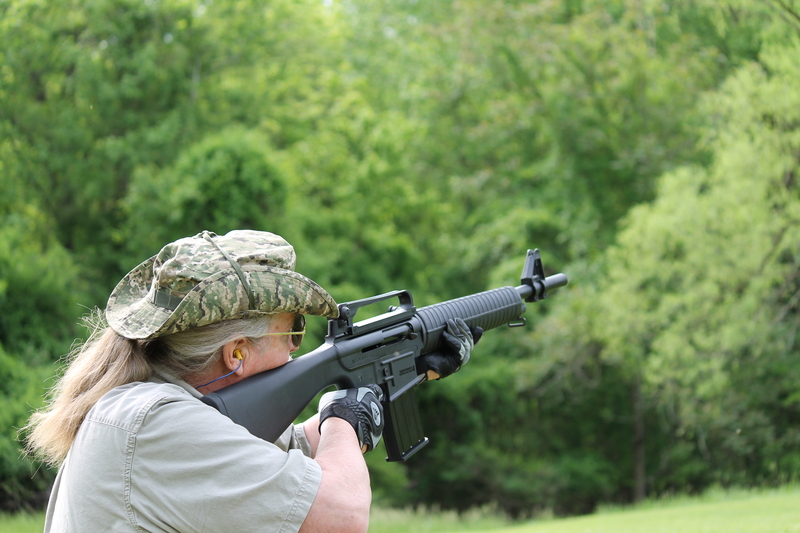 Rob Cowan, Arlington RPC club president, airs out his MKA 1919 at the club bust fest. Get Them While You Can, Before The Ban!! Last gasp for the on time releases is coming up. The Arlington Rifle and Pistol Club is proud to announce that Mr. Chuck Sayre, coach of Arlington’s Juniors Team will be presented the NRA 2012 Outstanding Youth Club Award at the September 14, 2013 NRA Fall Board of Directors Meeting in Arlington Virginia. Mr. Sayre spends three evenings a week and every weekend, coaching the Arlington’s Juniors team. He travels with the team to matches all over the country. This award is a tribute to his dedication to excellence and commitment to area youth. August was another busy month for Arlington. The Arlington Bust Fest on August 11thth was a blast. We had a great turn out. It was a lot of fun seeing members, families and guests busting birds. Ben’s son Eric was really impressive shooting trap. What made it so impressive is that Eric had to hold the stock of the shotgun under his armpit, because the shotgun was too big. Undaunted, he proceeded to blast every other bird out of the sky with his unique style of shooting. Arlington members and guests downed four packs of hotdogs, an unknown number of soft drinks and added a mound of broken clays on the trap range. It was a terrific day! The August 24th, Steel Plate Center fire Rifle shoot at the 100 yards was well attended. Steel plates had trouble hanging from the racks under the deluge of lead being thrown at them. We all had a great time. The August 17th frame build broke a record. We made 50 frames in less than two hours. A big thanks goes out to the Arlington Club members who came by to help support our Juniors Team. Saturday, September 7th, from 9:00 a.m. – 12:30 p.m. the Juniors Fundraiser Frame Build will take place outside by the Juniors shed at the Barnes Range. No experience or tools are necessary. We work on an assembly line with each person performing one or two simple tasks. It is a lot of fun and it’s a great feeling to be able to help our Juniors Team. Sunday, September 8th – Bust Fest, at Trap 1 from 9:00 – 2:00 p.m., we will be lining up at the trap range to break some birds. The cost is all the birds you want to break for $10 per shooter or bring a box of birds. The weather is supposed to be great and we will have hotdogs and soft drinks at the shoot. Wednesday, September 11th– Arlington Club Meeting will be held in Memorial Hall from 7:00 – 9:00 p.m. We will be talking about our upcoming club events for September and October and some updates about the pending new gun laws. The Arlington Swap Meet will be at the back of the room if you have any items to sell, trade or give away. If you have an unusual firearm or item of interest, please bring it to share with the club at our show and tell period. We will also have a question and answer time for anyone who has a firearms related question to ask club members. Saturday, September 21st we will be having a 100 yard Steep Plate Center Fire Rifle Shoot. We will have 4 more brand new 12” steel plates to shoot. It is a lot of fun shooting reactive targets. You will also have a chance to check out some of the latest preban purchases club members have made. Since we are moving our frame build to September 7th, we will not be having a frame build on September 22nd. I hope to see you at the range soon! The AGC only has two target frames left in their inventory. To meet the growing need, we will be having an unscheduled target frame build at the Juniors Shed Saturday from 9:00 a.m.- 12:30 p.m. Please come out and give us a hand. We need to raise some money to support the Juniors. No special tools or skills are required. We use an assembly line process, where each person performs one or two simple tasks. Everyone has a lot of fun and leaves with a good feeling for helping our Juniors team.